Open your eyes. Under dull peach of sun, you are waist-deep in gentle waves. Ahead, a gentle bandage of beach slopes into a grassy rise. The air pollen-thick, it's impossible to guess how high the bluff ascends or what shape the earth beyond its peak might take. It could be the fingernail of a giant, a seismic blip of the ocean floor. Wait until nightfall; the silhouette of the island will reveal itself under a smear of constellations. You can see no other land. In every direction the horizon is razor-flat. You have no choice. This island is your only destination. Developed by Ed Key and David Kanaga in 2013 as a "non-traditional and nonviolent" experience, Proteus is a game. Reviews hailed it as revolutionary and intoxicating, while mainstream gamers shot it down as short and boring. Conceived and received as an anti-game, though, it might be worth making sure it isn't something else entirely. Proteus feels like a missing link between the gallery and the gigabyte, a pixellated isthmus between passive and interactive experience, escapism and simulation – apt indeed for a game named after the Greek sea-god of mutability. If you plan to play the game for yourself, I would advise doing so before reading the rest of this article. When you come back, we will have visited the same places, witnessed the same events, maybe even experienced the same feelings – but nothing competes with the act of first-hand exploration. I'll wait. 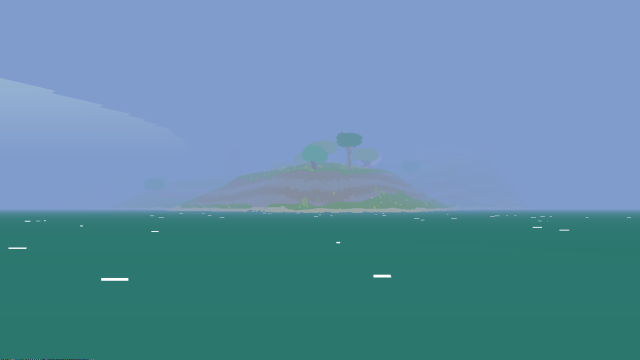 Each time you play, Proteus randomly pieces together an island from basic building blocks, creating new and unique landscapes for each playthrough. That's it, that's your lot. Where other games kick off with a bomb, a starting gun, a missing treasure, Proteus' inciting instance is simply being. The player is invited to explore, if only because there's nothing else to do and, even then, compared to most other games, only in a restricted capacity. The one interaction you can make beyond movement is exactly its opposite: to sit. As you explore you get the feeling that, once your island exists, it doesn't need you. Like all landscape, it is complete without your intervention. That is not to say you are the first visitor. The islands's flora and fauna camouflage relics of human existence crumbling atop hills or down valleys. These landmarks, recycled between each island, are the cottage, the totems, the big tree, the graveyard and the lonely gravestone. It is possible to interact with these world-building elements, but only passively. To witness their secrets youmust be present at the right place, the right time. There are two exceptions, but each is a Faustian pact. First you have the monoliths, black and dimensionless. Unlike the other more natural or historical artefacts, at no point do they feel truly part of the game world. If you're lucky enough to be on an island with multiple monoliths, you can walk straight up to one and it will teleport you to another. In any standard open-world game this would be a wonderful shortcut between missions; in the amotive world of Proteus it's unsatisfying. Use them before you understand the lay of the land, the process is disorientating and sometimes unhelpful – they move you somewhere you don't yet recognise. Use them after your inner-cartographer has mapped the island and they're speedy solutions to a problem that doesn't need solving. There may be meaning to this. Stand by a monolith at night in autumn. Dark skyscrapers crowd the horizon, the land bathed in red mist. Are the monoliths the remnants of a fallen city? Is this lush island the last respite from ecocide? Is Proteus asking us what we sacrifice in our desire for speed? There is an isolation to be found in playing this game, in roaming this island that's all yours and no-one else's, that urges you to slow down. After all, if you're looking for shortcuts through this landscape, you might be playing the wrong game. If, however, progress is what you seek, find the ring of standing stones. Step inside the ring. Listen to the soft thud of your heartbeat as the darkening sky turns jonquil, puce, Oxford blue. When the moon rises, when the crickets chirp, transparent flecks of light gravitate here, to spin in a frantic circle. Time speeds up. The days fly by. Rolling clouds give way to shooting stars, wind tousles the trees in the dawn and in the dusk, and dawn, and dusk, and dawn. Even if by this point you have explored every pica of your island, the Koyaanisqatsi-esque effect is startling. You can't help but feel you're missing out on something. 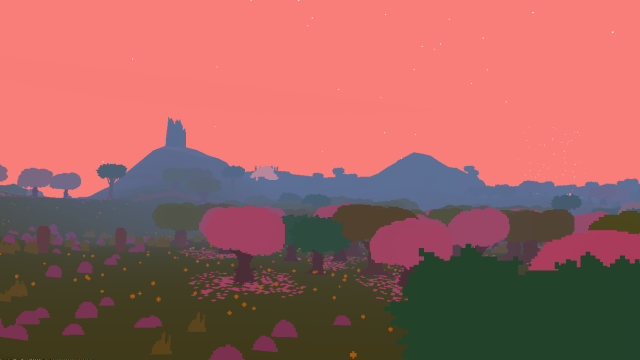 More pressing, though, is the promise of progress: in the game's one moment of deliberate intervention, on your first play Proteus steers you into this circle of light, lest you ignore it and become trapped in perpetual springtime. As it turns out, this is the one goal in Proteus: to trigger seasonal change, and cycle with your island through the year. Within this mechanic, the game hides its emotional triggers and symbolic weight which shifts it beyond considerations of game or anti-game, and into the realm of art. Spring is shrouded in pastels, mist and cloud. You lose your bearing while wandering. The background music, smooth and harmonious, provides a gentle backdrop to a landscape at once unassertive and experientially rich. As an environment it nurtures exploration, yet each landmark surprises. Even the most seasoned gamer is encouraged to move with baby steps. Summer arrives glorious, clear and noisy. Dragonflies, bees, bouncing mushrooms, yellow flowers popping to their own drumbeat. Almost every game, your first action in Summer is to climb the nearest, highest peak to fully survey your island, to make sure its contours are the same as what you thought they were in Spring. Sometimes what you thought was a bay is a lake, the graveyard is here and not there. Momentarily freed from the burden of exploration you will find yourself chasing bats, being chased by bees, bothering the wild chickens, enjoying the roll of the hills in the sunset, sitting on a mountaintop to watch forgotten satellites streak across the sky. Autumn rolls in like a foul wind. Everything begins to decay. Dragonflies scritch and spasm on the ground, crabs lie still and spit, rainclouds omnipresent. The music drops to mournful horns, punctuated by synths keen of futility. But don't rush into that faery ring just yet – you will want to spend at least one night in this melancholy arena. As the island's life starts to slip, the landmarks reveal secrets under darkness. Fireflies solidify into ghosts, stars pulse and throb with the energy of ancient gods. A visit to the run-down cottage has the opposite effect to the ring of standing stones: time will stand still. It is tempting to stay here indefinitely, but even this anti-game has an ending. Winter. It's sparse and frightening, though not without its own beauty – some evergreens remain among the skeletal trees. Yet after so much life the white and grey colour palate feels cruel. There is nothing much to this season but there is so much of it. When your feet rise from the ground and you find yourself floating towards the clouds you want to protest – you want more time, you want to see spring again. Impossible. If you are lucky you will see the aurora borealis, but that's your last, a hallucinogenic consolation before your vision blurs to black. Okay, so island seasons mirroring life stages is pretty basic, but consider the position of the game within its industry, and the industry in turn against the history of entertainment. As a means of human expression, gaming is still in its own springtime. This blocky, experimental attempt handles a simple metaphor with surprising deftness, leaps and bounds ahead of all those gunge-coloured, high-resolution, photorealistic shoot-em-ups. Just as you feel your way across its imaginary land, piecing together a strangely affecting version of the human condition, Proteus is an example of a medium feeling its way to maturity. That said, the experiment can sometimes go awry, and in hindsight my first playthrough of Proteus was a little too simple. As I set foot on shore a chorus rose up around me. The soft slope rose steadily into a wood of pink trees, probably lotus. Emerging from the wood I found a shallow basin, in the basin a graveyard - and I had thought I would find only life here. All the more haunting, none of the gravestones bore details of the bodies beneath, or what felled them. I felt a little melancholy, a tad more reverent, but most of all surprise that I should even be feeling either, seeing as they're pretty complex emotions. Was this not just a a game? As if to correct this feeling, as I ascended a ridge I found a circle of totem poles – a little outlandish, a little more unreal – and on the other side, a steep drop. My first island was a pancake of land pinched down the middle to create a bisecting, snow-capped mountain range. Alongside a limited sampling of landmarks, I found only one variety of frog, no crabs, no bees and, although there are only two in the game, no birds. None of which I knew I had missed, for how was I to know? I had never been there before. This was my first time. Which is, depending on how you look at it, a nice quirk or a damning glitch of procedural generation – not every playthrough will allow every player to experience every aspect of the game. Then again, like the best paintings, books, songs, and people, repeated visits reveal unexpected insights. To go even further: if each island is taken as a lifetime, similar but different, Proteus is perhaps one of very few artworks to create in its audience the feeling of what it might be like to reincarnate. On my second playthrough I was astounded to discover those elements which I'd missed the first time around, as well as the new interactions they unlocked. On my third I discovered the island could have its own satellite islands, either within lakes or offshore. In subsequent playthroughs I'd race to the stone circle in spring, itching for the explosion of summer, where I could fully understand the shape of the island, and see if it was pleasing, or if it was confusing, or an uneasy mixture of both. My most rewarding play so far placed me the base of a mountain which, once traversed, revealed itself to be the lip of a giant crater that took up almost the entire island. At the centre of the crater was the graveyard, and slightly past that was the cottage, and to the left of the cottage was the big tree. This combination, in this particular order, felt correct – even more so when I found the stone ring on the far side of the island, almost on an island of its own connected by an isthmus. Moving between the cottage and the stone ring felt less like exploration and more like a journey. This island felt the most considered, the most constructed – but it was randomised, as were the dozen others before it. I dallied more than I should have in autumn, and was genuinely sad to leave in winter. Again I had to remind myself: it's only a game. But I will never return there, to that place that felt special, not ever. And you will never even get to see it. This is, perhaps, what it would feel like to live many lives. I could explain them, but never re-experience them, or show them to others. After racking up enough consecutive islands, or lives, the pattern of their construction would reveal itself. Though assembled differently the checkpoints would remain the same and with increasing familiarity their individual importance would fade. Pleasure, if there was any to be had, would become complex, instead derived from how the repeated experiences fit together. Similar but different, easier to understand with each turn, simultaneously infinite in their potential. On paper, it definitely sounds as if the game rightly earns its anti-game title; it isn't even a very good simulation of visiting an island. The graphics are deliberately rudimentary, forcing you to fill in much detail with your own experience of nature, and even then it's easy to get things wrong. For a time I mistook a bunch of bushes for rocks, and was only corrected when, preceding a rainstorm, I saw them shivering in the wind. It was, of course, a wind that I couldn't feel, a rain I couldn't taste. The rough pixelart both reduces and cracks open the ecology of all island life. There's certainly no biological match for the cluster of squawking plants I came across, which shrank into the ground as I approached; though the squirrel, which also ran away, was undoubtable. If you want a real-world equivalent, Viðey off the coast of Iceland comes curiously close. While short on dense pixellated forests, all trees having been felled by Vikings during settlement, it is home to artworks which are mirror-images of many of Proteus' landmarks. Richard Serra's Milestones are reminiscent of the dark monoliths which teleport you around the digital hills, Yoko Ono's Imagine Peace Tower lights up the first half of the long Icelandic winter much like the standing stone's ghostly circle, and there is even an unnamed, unexplained pillar overlooking Viðey's dockyard, a spiritual companion to a grave often found on Proteus' tallest mountain, marking some unknown exile from the graveyard, looking out to sea. Yet by stripping the open world gaming mechanism down to its very bones, presenting the player with a restricted universe in which you control nothing but your own first-person perspective, whether by design or accident, Proteus alights on something much deeper and hauntingly resonant. I can of course speak only for myself, but repeated plays feel like returning to a particular artwork and finding it has changed because you, in some way, have also changed. It is possible while playing Proteus to feel all your edges having shifted somewhat while you weren't looking – and like the best art, I took Proteus out into the world with me. I found myself thinking differently about the landscapes I moved through, about their construction and my place within them. It simulates the feeling of living. Where else would you design an experience like that, but on a virtual island?